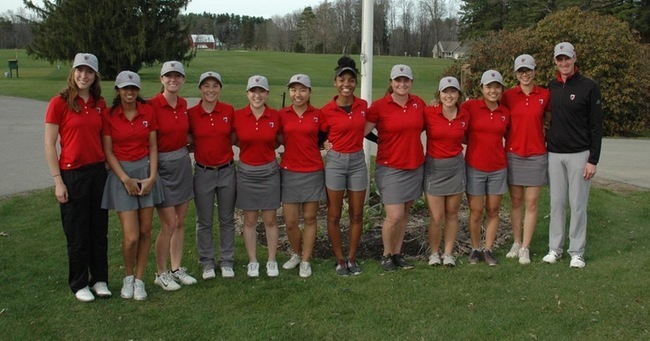 For the second straight day, the Carnegie Mellon University women’s golf team brought home a team title and had the top four finishers when the Tartans competed in the Saint Vincent College Invitational at Champion Lakes Golf Course in Bolivar, PA. The Tartans carded their second-best 18-hole round of the season on Sunday at Champion Lakes when they finished with a team score of 310. The victory was the second of the season for the team ranked eighth in the nation. First-year Charlotte Simpson earned the top finish of the day by shooting a four-over par 75. Following Simpson was senior Summer Kitahara with a 77, junior Carly Jordan with a 79, and sophomore Yedin Lui with an 80. First-year Catherine Tianhong Yu carded an 85 as the fifth player of the group for the Tartans. Simpson’s round was one of her career best and marked her second medalist honor of the year. She leads the team with a 78.0 scoring average through 15 rounds. Playing as individuals for the day were senior Isabelle Tseng, senior Ginger Glass, and sophomore Sanchi Gupta. Tseng finished with the fifth-best score of the invitational with an 84 while Glass carded a 97 and Gupta a 100. On Saturday, the Tartans won the Grove City College Spring Invitational after carding a team score of 329. The Cardinal and Gray entered a ‘B’ Team which placed second with a 333. Sophomore Lavonca Davis, who played on the ‘B’ Team claimed individual medalist honors after carding a 79. Simpson and Jordan both shot an 80 to finish tied for second. Kitahara carded an 84 with Lui, ending the round with an 85. Rounding out the Tartan’s top team was Yu with a 91. Davis led the ‘B’ Team followed by first-years Shanice Lam and Cristina Pullen who both carded rounds of 84. Tseng fired an 86. Glass fired a 96 while Gupta ended Saturday with a 99. The ninth-ranked Carnegie Mellon University women’s tennis team defeated the 23rd ranked Kenyon College Ladies on Sunday, April 15, at The Club Sport and Life in Monroeville, PA, after rain forced the match inside. The Tartans finished the match with a 7–2 victory and are now 16–3 for the year. Sophomore Vinaya Rao and senior Katie Lai paired at second doubles for the first win of the day, winning 8–6. The Tartans took a 2–1 lead into singles play by picking up an 8–4 victory at third doubles by junior Jamie Vizelman and first-year Alex Iordache. Senior Cori Sidell finished singles play first with a 6–2, 6–3 win at No. 1 singles and Vizelman made the score 4–1 with a 7–5, 6–2 win at third singles. Lai and Rao finished singles play about the same time with Lai earning match point at fourth singles, 6–4, 6–2. Rao dropped her second singles match, 2–6, 6–2, 7–6 (12–10). Also winning for the Tartans was junior Marina Selenica at fifth singles, 6–2, 6–4, and first-year Hannah Rosenfield at sixth singles, 6–2, 7–6 (7–0). The Tartans will next face John Carroll University on Sunday, April 22, at home at 10 a.m. before the University Athletic Association (UAA) Championships begin on Friday, April 27 in Altamonte Springs, FL. The ninth-ranked Carnegie Mellon University men’s tennis team won its fourth straight match on Sunday, April 15, when it topped 16th-ranked Kenyon College, 5–4, on the indoor courts at The Club Sport and Life in Monroeville, PA. The Tartans are now 12–5 for the season. Sophomore Robert Levin earned match point for the Tartans after rebounding from a first-set loss to earn a three-set victory, 3–6, 6–1, 6–4. The Tartans held a 2–1 advantage after doubles with wins at first and third doubles. The 15th-ranked pair of junior Daniel Levine and junior Chaz Downing won 8–7 (7–5) at the first position while sophomore Nicholas Calzolano and first-year Ray Boppana won at third doubles, 8–2. Levine, ranked second in the nation, made the score 3–1 with a 6–2, 6–0 win at first singles before a win at second singles by Kenyon made it 3–2. First-year Kailas Shekar extended the Tartans’ lead to 4–2 with a 6–0, 6–1 win at fourth singles. A three-set victory at third singles for Kenyon and a 7–6 (7–3), 6–2 win by Kenyon at sixth singles tied the match at 4-all before Levin earned the team win with all eyes watching. The Tartans will put their win streak to the test on Sunday, April 22, when John Carroll University visits Pittsburgh for a match at 10 a.m. The Carnegie Mellon University women’s track and field team competed at the Slippery Rock University Open on Thursday, April 19 and turned in two top spots in the unscored event. The 400-meter run highlighted the day, as the Cardinal and Gray swept the top three places. Senior Sarah Cook crossed in 59.23 to win the 400-meter run with juniors Debarati Bhanja and Rose Ciriello placed second and third with times of 1:00.15 and 1:01.89, respectively. Senior Rhiannon Farney ran to a first-place finish in the 5,000-meter run after crossing in 19:57.67 while first-year Parvathi Meyyappan placed second with a time of 5:11.16 in the 1,500-meter run. Sophomore Leah Kendrick took second in the 100-meter hurdles with a time of 15/76 and sophomore Joanna Baranowski placed third in the 400-meter hurdles after crossing in 1:11.82. Senior Kiersten Chuc tossed the hammer 42.68 meters to place second. The Tartans will next compete on April 28-29, as they host the UAA Outdoor Championships at Gesling Stadium. The Carnegie Mellon University men’s track and field team competed at the Slippery Rock University Open on Thursday, April 19. The Tartans claimed two top spots in the unscored event with first-year Andrew Singh running a season-best time in the 5,000-meter run. Singh crossed the finish line with a time of 15:40.10 in the 5,000-meter run to place second and junior Jacob Halasowski placed third in the event with a time of 15:45.26. Junior Isaac Mills crossed first in the 400-meter run with a time of 52.21. The Tartans’ other top finish came in the 800-meter run where first-years Arthur Dzieniszewski and Michael Cabral finished first and second. Dzieniszewski crossed in 2:02.01 while Cabral finished with a time of 2:02.47. Sophomore Liam Walsh took second in the 1,500-meter run with a time of 4:11.51, as sophomore Josh Kalapos crossed in 4:12.64 to place third. In the field events, first-year Bram Miller took second in the shot put and third in the discus. He tossed the shot put 14.35 meters and the discus 44.29 meters. Senior Jacob Schofel placed third in the hammer with a mark of 49.96 meters. Senior Eloy Fernandez and sophomore Fred Dauphin placed second and third in the triple jumps after recording jumps of 13.50 and 13.29 meters, respectively. Junior Reed Farber took third in the high jump after clearing the bar at 1.80 meters. Senior Tommy Mansfield placed third in the pole vault after clearing the bar at 4.46 meters.